This essay treats education biographically and uses special education as a way of discussing how education generally defines itself. While education can be variously defined, this essay is less concerned with definitions of education and more interested in how education, through its various classificatory schemes, defines itself. In an essay that treats the school as trickster, Adrea Lawrence discusses the plasticity of education and the ways that Native American schooling made schools themselves into shape shifters, into contradictory spaces that morphed in relation to the Americanized subjects they desired.1 “General” education is similarly contradictory and likewise shifts and morphs through the use of classificatory schemes. Though scientific in description, special education classifications have a beginning and change over time and thus mark the life history or biography of education. Although biographies are traditionally of people, perhaps also of places, things, or ideas, the biographical approach can also be applied to social institutions. In an effort to resolve these problems, experts established determinations predicated on mental age, a concept newly derived from the cultural epoch conclusions of child studiers like G. Stanley Hall who argued that, despite being adult in appearance, those “savage” populations encountered through Western colonialism were, in fact, cognitively childlike.3 This conclusion provided the intellectual undergirding for the science of classification, which sought to make visible through the technology of intelligence testing that which appearance might conceal; that is, experts who advanced the science of classification were concerned with the possibility that individuals with retarded cognitive faculties might pass as normal and thus put the general population at risk of diminished prosperity. It thus became increasingly important to identify which bodies were feeble-minded and to define the categorical spaces of normality and abnormality within education. The categorical spaces of Progressive Era special education emerged from the purposively indeterminate spaces of intermediate and ungraded classes, spaces that allowed for easy ingress and whose allure was the promise of eventual egress. The movement of students within these spaces suggests that classificatory schemes were the producers, not the result, of a progressive educational order of things.6 The history of Progressive Era special education is thus a history of an attempt to clarify difference through classificatory schemes designed to determine the allowed proximal distance of special to “general” education.7 The parameters of this distance would be discussed and debated within the pages of scientific journals like the Journal of Psycho-Asthenics and point to attempts to validate the emerging field of special education. The science of classification qualified this emerging field and its experts as uniquely capable of interpreting human difference and was the expertise that Farrell sought in her request for a theory of special education. This classification quickly became part of what Joseph Tropea describes as the “backstage social order” of Progressive Era special education, which required “actors’ tacit understandings and interpretations of their organizational situations” as well as the “learning of backstage roles, rules, and definitions.”10 This backstage social order helped educational leaders deal with the recurrent problem of lagging students through transforming both the organization and rhetoric of education. Educational leaders thus managed students into special classes where they did not count toward general retardation rates. In addition to this administrative tactic, schools also issued work permits that allowed students to be released from compulsory school attendance.11 Thus, despite Ayres’ insistence on the neutrality of the laggard, the condition of retardation still presented an administrative concern that lagging students would drain educational coffers and that their slow advancement would retard the educational progress of all students. This administrative concern has organized special education since it emerged concomitantly with the ideal of a common school system. Boston public schools, for example, were from their beginning organized around “separate instructional settings for certain children whose public school attendance was deemed desirable but whose presence in regular classrooms, for a variety of reasons, was not.”12 While intermediate and ungraded classes cast doubt about the commonness the common school movement, Roberts v. Boston (1850) had already established legal precedent for not only excluding black children from public education but for also engendering a separate and unequal logic that continues to order special education.13 The tension between increased school attendance and the concern that not all children were suited for general education led the Boston School Committee to create intermediate schools with the hope that special instruction might enable lagging students to rejoin their common peers. The tension between intermediate and ungraded classes being spaces of indefinite detention and spaces that would indefinitely collect miscellaneous students would not be resolved by Progressive Era special education. This did not prevent experts like J. E. Wallace Wallin from attempting to resolve this tension through clarifying special education’s classificatory schemes. Noting that “the word special is generic and applies to eight or ten different kinds of special classes,” Wallin argued that special classes should be reserved for “imbeciles, morons, borderline and seriously backward cases,” and that the term ungraded classes “should be applied to classes in which children who are retarded in one or more branches are given individual attention.”15 Despite Wallin’s attempt to cohere the definition of special education, its spaces remained porous, evident in Wallin’s introduction of a third type of class, “the elementary industrial class,” which was designed for young adolescents who “are appreciably backward or who are over age because of inability to cope with regular curriculum, and who withal are industrially inclined.”16 That it was possible for students to be placed in these classes for reasons known only to experts like Wallin suggests how definitional fluidity creates categorical spaces. Indeed, with the discovery of the moron, experts would increasingly rely on this use value of indeterminacy as well as their ability to accurately interpret the borderlands and borderlines of feeble-mindedness to validate their expertise. Adrea Lawrence, “Our Trickster, The School,” Education’s Histories, May 1, 2014, http://www.educationshistories.org/trickster-school-part-1/. E. E. Farrell, “Special Classes in the New York City Schools,” Journal of Psycho-Asthenics, 13, nos. 1-4 (1908-09): 91. See Bernadette Baker, “‘Childhood’ in the Emergence and Spread of U.S. Public Schools,” in Foucault’s Challenge: Discourse, Knowledge, and Power in Education eds. Thomas S. Popkewitz and Marie Brennan (New York: Teachers College Press, 1998): 123-37. For more on the necessary and much needed interplay between remembering and forgetting within education see Sara Clark, “Remembering in Order to Forget,” Education’s Histories, July 30, 2015, http://www.educationshistories.org/remembering-forget/. James W. Trent, Jr., Inventing the Feeble Minded: A History of Mental Retardation in the United States (Berkeley: University of California Press, 1994). For more on this policy implication see James Joseph Scheurich, “Policy Archaeology: A New Policy Studies Methodology,” Journal of Education Policy 9, no. 4 (1994): 297-316. For a visual interpretation of this distance see Figure 1. 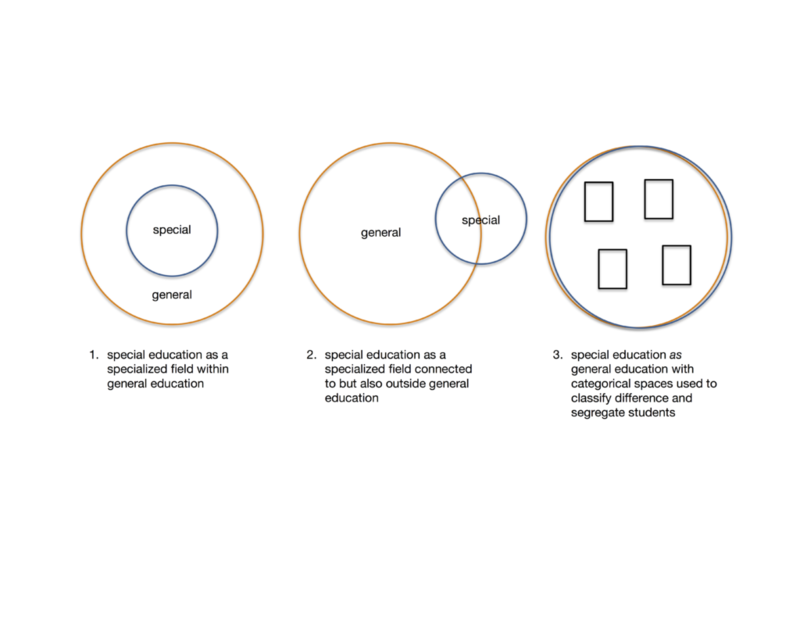 While Images 1 and 2 are perhaps standard ways of understanding the relationship between special and “general” education, this essay argues for a mutually constitutive relationship as illustrated in Image 3. As discussed in Part 2, this critical perspective of special education has methodological implications, which suggest that special education is a way of better understanding education’s “general” histories as well as policy implications, which suggest that special education policies in addition to classifying particular subjectivities also work to define education generally. Leonard P. Ayres, Laggards in Our Schools: A Study of Retardation and Elimination in City School Systems (New York: Russell Sage Foundation, 1909), 219. Joseph L. Tropea, “Bureaucratic Order and Special Children: Urban Schools, 1890s-1940s,” History of Education Quarterly 27, no. 1 (1987): 36. Robert L. Osgood, “Undermining the Common School Ideal: Intermediate Schools and Ungraded Classes in Boston, 1838-1900,” History of Education Quarterly 37, no. 4 (1997): 377. Emphasis added. On this latter point, see, for example, Beth Harry and Janette Klinger, Why are there so Many Minority Students in Special Education? Understanding Race & Disability in Schools (New York: Teachers College Press, 2006). For discussion of the terms Botany Bay and omnium gatherum settings, see Osgood, 384, 394. J.E. Wallace Wallin, The Mental Health of the School Child: The Psycho-Educational Clinic in Relation to Child Welfare: Contributions to a New Science of Orthophrenics and Orthosomatics (New Haven, Yale University Press, 1914), 387.